Everybody knows that in the corrupted Italian political system electoral campaigns are more or less based on the trade of votes in exchange of privileges and on the shameless distribution of all kinds of promises. However, it was beyond imagination that an Italian party would organize an international fraud worth billion Euro, giving raise to anti-mafia questions, and then make it also an electoral fraud, by asking the votes of the citizens to receive the power to complete it. This is what happens in Trieste, in the municipal election of June 2016, and the party involved is the PD (Partito Democratico) with some of its well-known national and local heads: Debora Serracchiani, right-hand of premier Renzi, deputy Ettore Rosato, leader of the Party in the Chamber, Senator Francesco Russo and mayor Roberto Cosolini, who stands for re-election. The fraud worth billion Euro is the attempt to illegally eliminate, by the mean of Italian anti-constitutional laws, a whole Northern sector of the international Free Port of the Free Territory of Trieste, a little sovereign State entrusted under a mandate of temporary civil administration to the Italian Government (not to the State of Italy). This constitutes an international fraud because the area is constrained with the right to use it of all States pursuant international treaties in force, which are also binding for the Italian Government, as provisional Government of the Free Territory of Trieste, as well as for the State of Italy under its own Constitution. The fraud is worth billion Euro and is under anti-mafia questions because it would allow not only massive building and housing speculations in the port area by causing the collapse of the real estate market in Trieste, but also the permanent diversion of trade routes to certain particular ports of Southern Italy: Naples, Gioia Tauro, Taranto, Bari, Brindisi. Also, the engine of the international fraud is neither the PD or other Italian political parties. It is the national and local Italian network of corruption, which entangles legal and illegal interests to the point of influencing public offices, political parties, press, and it does business with whoever is in the government. This is also the reason why the scandal of this massive fraud remains hidden by the active and passive complicity of all Italian Parties (including legalitarian Movimento 5 Stelle), of the media (including investigative media: newspaper Il Fatto Quotidiano, TV broadcast Report, etc. ), and of Italian magistracy, which covers-up all complaints and takes no action. The only oppositions are therefore those of our investigative newspaper, La Voce di Trieste, the Movimento Trieste Libera – Free Trieste Movementand by the environmentalists connected with them, which are also receiving the support of diplomatic actions of the I.P.R. F.T.T. – International Provisional Representative of the Free Territory of Trieste. 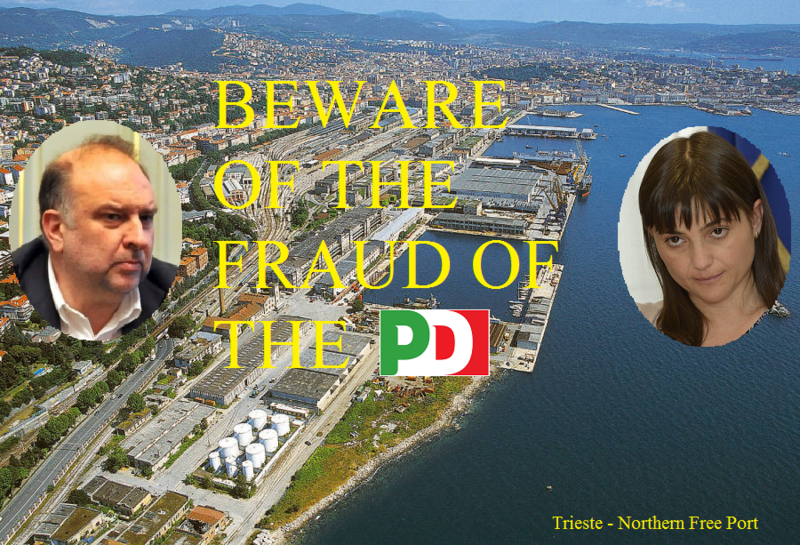 Since 2013, the local administrations and daily press of Trieste (Il Piccolo, of editorial group Espresso) are under the monopoly of the PD, which has used its local and national power to speed up, unpunished, the fulfillment of the fraud at the expenses of the Free Port with an unprecedented aggressive policy made of disinformation and defamation, yet, praised by a court of aspiring advisors and concessionaires. In facts, the PD has defamed and substituted the president of the Port Authority who defended the Free Port, Marina Monassi, it has illegally sabotaged her concession tenders, it has deceived the Italian Parliament tricking it into approving three fraud-norms that go against the Italian Constitution and outside the jurisdiction of the Republic of Italy, it has forced the Commissar of the Government to enforce such fraud-laws with an illegitimate decree, as well as avoiding to answer to the anti-mafia questions. All of this happens while Italian magistracy files without investigations all of our detailed and documented criminal complaints against the heads of the PD, at the same time as it accepts the numerous reckless complaints against us by mayor Cosolini, who wants to silence our oppositions with the support of the lawyer that he has nominated chairman< of a Municipal multi-utility. The truth is that the heads of the PD and of the Renzi Government who are responsible for the operation are well aware to be attempting a massive fraud with scandalous illegal supports, and they do also know that out denounces can stop the fraud, also before international Courts. But, instead of stepping back, they try to force their operation to present it as a fait accompli, being re-elected in June with shameful deceptive propaganda to make electors believe that the operation is legal, and it would save Trieste from economic problems. While it would be its ultimate downfall. As the day of the election becomes closer, this kind of propaganda of the PD crossed the line going far beyond grotesque, with newspaper articles filled with promises of historical trains, museums, bicycle paths, and other amenities, as well as a future EUR 50 million fund already praised as an immediate, certain solution for all. The truth is, once gain that contrarily to what the heads of the PD and their newspaper are trying to sell to public opinion, their illegal operation at the expenses of the Free Port is far from complete, and it can be blocked and declared null and void for more than legal reason, including after the elections and even if they started the works, finally exposing also all civil and criminal liabilities of the figures of power involved. Figures who do therefore, disgustingly, to disk everything, desperately, telling all possible lies, and avoiding public debates wit us, since thy are aware that if they lose their power they lose also the scandalous immunity that so far was granted to them, in accordance with the typical malpractice of the Italian political system. Now it is clear that in order to realize the concrete rights of the international Free Port it is necessary to eradicate as soon as possible the whole Italian political system, made of corruption and parasites, from the Free Territory of Trieste. But it is as much clear that the Republic of Italy needs to get rid of it as well to grant the basic rights of its own citizens. And now it is also time to see if in Italy there still are colleague journalists who are free enough to investigate and write about what we are not scared to denounce to public opinion. The facts are there, there are the billion Euro fraud and the people who are responsible for it are public figures who are stealing international properties and rights by the mean of operations under anti-mafia questions. So, what are he reasons of the silence of Italian press?